Happy Thursday, guys! A reader requested this post about my favourite cream and liquid products and how to apply them, and I thought I'd share it with you guys today! 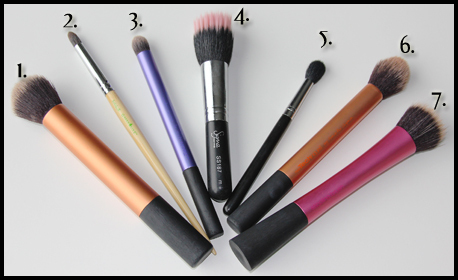 Where application of cream/liquid products is concerned, I like to use synthetic brushes with densely packed bristles. I feel like the densely packed bristles afford me more control, and disperse the product more evenly compared to loosely packed bristles. Real Techniques Buffing Brush - the best brush I own for applying foundation. I hate when foundation just sits on top of my skin, and this helps buff it nicely into my skin. Real Techniques Deluxe Crease Brush - this, I use on powder products for my crease. 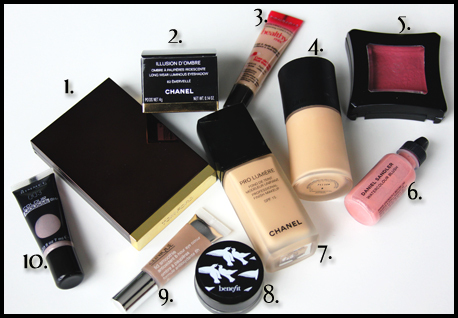 But I also use it for contouring with products like the Tom Ford contour cream. AMAZEballs. Sigma Stippling brush - this is a brush with loosely packed bristles. I don't normally use this, but when I want a very light, thin layer of product, usually on my cheekbones or cheeks, I use this. Sigma blending brush - this is a brilliant brush to use to blend out concealer underneath the eyes. I am a huge fan of blending out concealer with a fluffy brush - it buffs in the concealer well so that there's no 'cakey-ness' underneath the eye. Real Techniques Contour Brush - the best brush I own for face contouring. It affords me great control over where exactly the product goes, and allows me to spread the product well and evenly. Real Techniques Stippling Brush - this is very different from the Sigma stippling brush, because it is much more dense and stiff. I love this brush for foundation and applying highlighting cream.